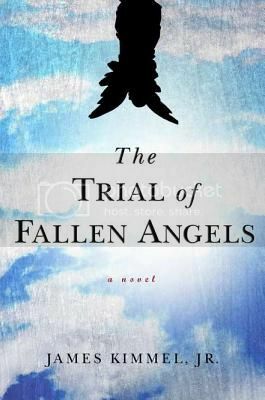 The Trial of Fallen Angels by James Kimmel, Jr. It is a fairly typical day for lawyer Brek Cuttler: play with the baby, go to work at her law firm, pick up the baby, stop at the store on the way home. The only problem is, she has no idea what happened after all of that. Brek’s next moment of consciousness involves sitting in an otherworldly train station, dressed in her favorite suit and covered in blood. Brek is is now in the afterlife, and she has been chosen to continue her earthly quest for justice by joining the team that presents souls for the Final Judgement. My oh my does The Trial of Fallen Angels ever have some intense moments! There are a couple of scenes involving Brek’s little daughter that made me have to put the book down and walk away overnight, because they were just too much for me to handle. One of the times I very nearly put the book in the freezer. Moms of young children, this book may just about kill you, be forewarned. At the same time that The Trial of Fallen Angels attempts to give you heart attacks, it also has some really beautiful parts. I simply adored the theme of connectedness that runs through the stories and the lives that Brek encounters as she learns how to present souls. The threads begin to weave together, illuminating not only the reader but Brek herself as to the reality of her past and that of her family. The Trial of Fallen Angels is unlike anything I’ve ever read and, although it gets slightly preachy towards the end, it is a moving book with great emotional impact. While this looks very interesting, I am going to heed your warning to mothers of young children and wait until I am in a better emotional place before reading this one. This sounds odd but also interesting! My children are teenagers so maybe I’m safe. Teenagers you should be okay. Even people with older grade school kids would probably be alright, it is mainly those with babies and.toddlers I am woried about.